Heterogeneous catalysis is not only the backbone of most processes in chemical production, it is also essential for most environmental technologies. Its importance for electrochemical processes and energy related chemistry has just been recognized. Heterogeneous catalysts have several advantages: they are easy to recover, do not tend to pollute the products and often have long lifetimes or can be recycled. Heterogeneous catalysts are extremely complex materials whose catalytic activity is determined by chemical composition, microstructure and transport phenomena, such as metal dispersion, metal loading, phase composition, oxidation state, dopants and modifiers, the support interface, porosity, pore size, nature of the support, surface polarity of active centres and supports, reactions kinetics, mass transport kinetics, gas diffusion, pore diffusion and others. To precisely analyse these properties and relate their importance to the catalytic reaction are time consuming, expensive and extremely challenging. Due to this complexity, the detailed understanding of heterogeneous catalysis is still limited and the subject of scientific studies at the highest levels. Studies of heterogeneous catalysts are demanding and often even the most sophisticated equipment cannot provide the detailed scientific answers expected by researchers. Clearly, economic process development cannot wait for such detailed understanding and the diversity of potentially important parameters as well as the huge search and parameter spaces have principally rendered the conventional one experiment at a time approach obsolete for serious catalyst discovery. Over the last 2 decades combinatorial and high throughput technologies (HTT) have evolved rapidly from critically regarded curiosities to standard technologies used increasingly in industrial laboratories. In contrast to Bio and Pharma, where HTT are established tools for HT screening, in catalysis and materials research HTT have been developed to accelerate synthesis, characterization, optimization of reaction conditions, scale-up and fine tuning to a level of high quality never expected in the past. Nevertheless, due to reduced data precision and reliability of many high throughput technologies, traditional catalysis research is still important and far from being replaced, especially for improvement of state-of-the-art production catalysts. There are only a few laboratories or specialized companies which have been able to develop HTT which produce data quality comparable to traditional research. HTT face a general problem, that of cost and complexity and the growing demand for high precision data, which makes it increasingly difficult to be used in small and medium sized companies as well as in academia. Most large companies have long-established well-equipped high throughput laboratories that usually serve R&D or production on a contract basis. 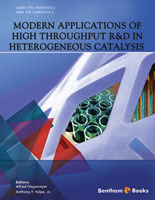 These general trends are reflected by the chapters in this book, which has fewer contributions from academic laboratories, while detailed reports from a broad variety of industrial HT laboratories provide an interesting view into their diversity of applied R&D activities related to heterogeneous catalysis. The book starts with an overview by hte-AG on the nature and state of HT experimentation in catalysis and process development, contrasting its screening nature in pharma applications. Next, the University of South Carolina reports catalyst development for cracking of Diesel to LPG on-demand as a means to simplify fuel transportation. Saarland University presents applications of parallel microreactors in highly corrosive catalysis applications. From DOW, the methodology of their new sophisticated workflow for high throughput research is illustrated with a case study on oxidative propane dehydrogenation, which includes DOE, catalyst development and reactivity screening. Engineering concepts of the Flowrence parallel small-scale reactor system are discussed by a group from Avantium with case studies on FT synthesis, oxidative coupling of methane and hydrotreating. The Langmuir Institute in collaboration with Saint Louis University describes interrogative kinetics, combined with high throughput methodology, which provides kinetic information with dependence on the surface composition of the catalyst. From the Leibnitz Institute in Rostock, development of parallel reactors for catalyst characterization, such as TPR, TPO, TPD and chemical titration, to speed up catalyst preparation and developments is outlined. Adaption of catalytic processes to biorenewable feedstocks is illustrated with a new adipic acid process by a group from Rennovia. The last chapter encompasses several contributions that make use of Chemspeed’s robotic technologies. It also illustrates the slow, but growing acceptance of a versatile commercial HT technology. After an introduction from Chemspeed on the challenges of standardization and acceleration of catalysis research, Liverpool University with ACAL energy reports on catalyst development for fuel cell applications. From Lille University and several collaborators a versatile workflow for development of catalytic reactions is presented, which encompasses homogeneous, heterogeneous and bio-catalysis, HT screening, and rapid characterization and analysis tools. DSM describes their approach to quickly identify optimal catalysts and reaction conditions for selected hydrogenation reactions. Fast and parallel zeolite synthesis is reported from the Sinopec Research Institute in Beijing. A robot-controlled catalyst synthesis platform for heterogeneous gas phase catalysis has been developed at the Karlsruhe Institute of Technology. As also documented in this book, and in contrast to initial belief, HTT are increasingly used in complex applications. The results of such HT studies, i.e. the search for new catalysts or new materials, are more and more published in journals of the subject of interest. This limits the content of the scientific reports to the subject of interest and renders the high throughput effort with all its complexity and creativity to one of the tools whose scientific details are usually ignored or just abstracted, since not the focus of the specific journal. For the increasing community of scientists using HTT, the subject of HT, such as the development of new screening methods, the use of novel algorithms, acceleration of accompanying analytics or methods for data storage, mining, visualization or knowledge discovery, can only be found in publications of a decreasing number of specialized journals or books, such as this book, edited by A. Hagemeyer and A. Volpe. For HTT in academia and small companies the exchange of experience with other users of HTT is important, therefore HT journals, HT conferences and HT books remain the only platform to maintain such exchanges and I highly encourage especially the Editors of such Journals and books or organizers of such conferences or meetings to continue their efforts. Catalysts are critical for the production of chemical products, being used in vast majority of processes worldwide. Moreover, many industrial products employ catalytic step at some point during their manufacturing from raw materials. The effect is that catalysts add efficiency and great value to industry in general, and have the potential to save up to an additional 50 percent of the energy used by the chemical industry by deploying new and/or improve commercial catalysts systems, which would be highly beneficial in reducing the global energy demands of future. The global catalyst market in 2013 is approximately $15 billion, and catalysts added about $2.4 trillion of value to world economies. Catalytic processes were responsible for about 35 percent of the gross global products in 2011. Notably, the costs of the catalysts themselves are a very small fraction of the value that they create. These statistics highlight the importance of industrial catalysis. With advancements in the fields of Industrial Chemical Catalysis and Green Chemistry, which are covered in this new eBook, it is inevitable that the economic and social impact of catalysis will increase in the coming years. The discovery and optimization of organic and inorganic functional materials, including catalysts in industrial R&D labs, were revolutionized with the advent of high throughput research and development methodologies in the early 1990s. This involved the application of robotic syntheses and the screening of novel inorganic materials utilizing parallel arrays of spatially resolved and individually addressable library elements in (micro-scale) bulk or on two-dimensional surfaces. At the time, these new high throughput screening technologies promised to drastically accelerate innovation and dramatically shorten the development times of new and improved materials and thereby time-to-market. Today, 20 years later, although the early enthusiasm has tempered, high throughput catalyst synthesis and screening tools, software, and workflows have been further developed, automated and hardened, and scientists in both academia and industry are increasingly and in many cases routinely using high throughput techniques in their work. It is the purpose of this new eBook to take an in-depth look at the current status of high-throughput research and development in catalysis now that the field has matured. What has survived two decades after the hype? Which methodologies have become accepted by industrial R&D labs and which have disappeared? What real-world successes followed the early proof-of-principle work on model reactions? Are there modern applications available to industrially relevant and complex reactions today? This eBook covers the application of high-throughput R&D to both fundamental and applied catalysis including catalyst synthesis, characterization, and testing in various reactor types. Chapters from academia as well as industry make this eBook well-balanced, although somewhat weighted to professional industrial or service R&D labs as pointed out by Prof. Maier in the preface. Included are applications ranging from optimizations of established industrial catalysts to the discovery of innovative new materials, examples of the development of innovative parallel characterization methods, and cases of real catalyst testing in small-scale reactor systems. There are also chapters that cover commodity chemicals produced using continuous gas phase processes as well as fine chemicals produced in liquid phase batch reactors. The potential of industrial chemicals production from biorenewable feedstock is also presented. It is evident that model reactions are now rarely employed, with the steadily improving workflows being applied to relevant reactions and targets such as hydrotreating, Deacon oxidation, Fischer-Tropsch, propane dehydrogenation, C4 oxidation, methane coupling, exhaust gas catalysis, bio-based Nylon, fuel cells and vitamins. The interplay between academia and industry and the need for exchange of experiences among users via specialized journals and books is addressed by the early pioneer Professor Maier in the preface. Leibniz-Institut für Katalyse an der Universität Rostock e.V.